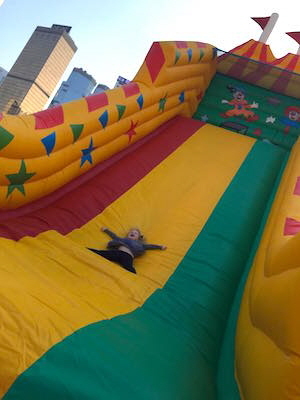 The Inflatable Slide is fantastic bouncy fun for children of all ages! Whether you are planning a children’s birthday party or public event, the inflatable slide is proven to be a winner every time! Each time they slide to the bottom, kids can’t wait to climb back to the top and have another go! The slide features deep sides and a high back wall, ensuring that children won’t bounce over the edge. A crash mat is placed at the bottom to cushion the children’s landings. A trained supervisor is present at all times to ensure that children are using the slide correctly and safely. Copyright © 2007-2015 S&D Leisure Rides & Better Rides Ltd.